San Francisco: The 2005 Suzuki Reno is truly a World Car. Suzuki is Japan’s fourth largest automaker. The Reno was designed by Italdesign in Italy, and the car is built by Daewoo in Korea. Available only as a five-door hatchback, the Reno comes in three trim levels, base Reno S, middle level Reno LX and top-of-the line Reno EX. The styling on a car that is only 169-inches long can be best described as cute. Only one engine is offered, a 2.0-liter 16-valve, DOHC, inline four-cylinder making 126 horsepower at 5600 rpm and 131 pound-feet of torque at 4000 rpm. A five-speed manual transmission is standard on S and LX models. A four-speed automatic is standard on the top-level EX and optional on the other trim levels. The EPA numbers are just OK for a small car at 22 mpg city and 30 mpg highway. The fuel tank holds 14.5 gallons. Though not a lot of horsepower by today’s standard, the car had sufficient zip for both city and freeway driving, at least in the five- speed Reno LX I tested. You should test the automatic version before buying. The engine is a bit noisy from the outside, but well muffled by the insulation so it is reasonably quiet inside. You can always turn up the eight-speaker, 140-watt, AM/FM/CD/Cassette sound system with MP3 playback capability that is standard in every Reno, even the base S.
Speaking of standard equipment, even the S version with an MSRP of $14,191 is well equipped with air conditioning, side air bags and power windows, heated mirrors and door locks standard. Speed sensitive power steering is standard on all Reno’s as are four-wheel disc brakes. However, antilock brakes with Electronic Brakeforce Distribution are a $500 option. 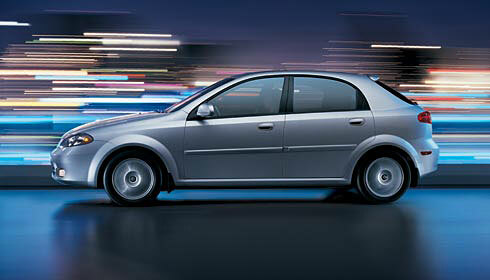 If you move up to the LX, you get 16-inch alloy wheels, fog lights, sunroof, cruise control and remote keyless entry. The EX adds leather upholstery. Even a “loaded” EX comes in at just over the $17,000 mark. On the highway, the Reno handles well, but it isn’t a sports car or even a sports sedan. A smooth ride takes preference to aggressive handling. The Reno’s tight turning radius is appreciated on narrow city streets. The interior is quite roomy and fit-and-finish is definitely up to competition, maybe even a bit in front of it. There are features not usually standard in this market segment including a height-adjustable driver seat; a padded center armrest, lighted glove box, a micron cabin air-filtration system, and controls for the radio on the steering wheel. If you need lots carrying capacity in a small package, the Reno fits the bill. The Front seats have a very long fore-aft travel, but at the expense of rear passenger legroom. Even with the 60/40 folding rear seat upright, this hatchback holds lots of stuff.